I'm on a more-fish kick. I'm not sure if it's a health thing, or a variety thing, or what, but I want to eat more fish. So at Atkinson's Market in Bellevue yesterday, I got two kinds of fish. Two whole frozen tilapia (I've been reading about how to make excellent roasted whole fish) for -- get this! -- $2.74(!!! 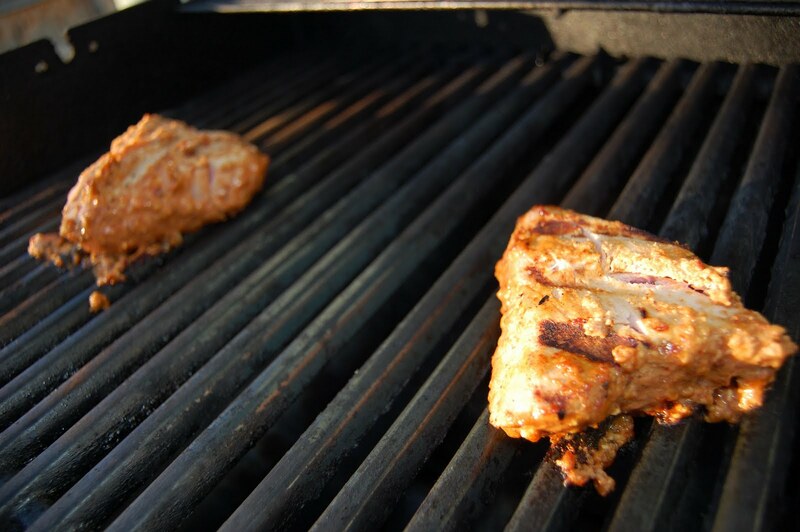 ), and two fillets of what was marketed as yellowfin tuna, but is usually marketed as ahi, for about $8. Since they didn't have any ahi steaks still frozen, I took the ones that had thawed, knowing I'd have to use them soon, and put the frozen whole fish in the freezer. Keep an eye out for what I do with those. I also got, last week, my first issue of Food & Wine magazine, which my husband had ordered for me for Valentine's Day. Yes, it took that long to finally, finally get here. Seriously, what takes so long to change a mailing list? Based on that first issue, I'm not entirely thrilled by the magazine because (as the issue was explicit about) it was addressing eating as part of world travel, and I just got back from only my second true international trip (I went to Indonesia when I was 13, and to New Zealand last month for our honeymoon, 19 years later. No offense to my Canadian friends and relatives, but when you live in US state that fronts Canada, Canadian travel almost doesn't count). I'm not exactly a true world traveller, and being stuck in Idaho, I feel even more "Americanified" than I am at heart. I went on my go-to food website, Epicurious.com, and searched "yellowfin tuna." Here are the Sicilian and Spiced Taco recipes that came up, which I was inspired by and combined. I made a marinade for the tuna steaks that was basically olive oil, lime juice, a medium-sized chipotle pepper in adobo, a small can of anchovies, three large cloves of garlic, pepper and a little rose wine (because that's what I had open in the fridge), all pureed fairly finely together. The chipotles and garlic played a stronger part than they did in the recipes because my husband loves both, and I adore garlic and have been building up my tolerance to/love of spice over the last few years. The fish steaks hung out in the marinade in the fridge for a couple hours, in part because I had to go to the store for more ingredients. 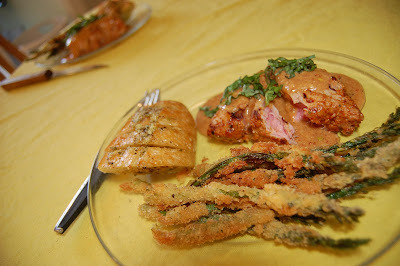 From Food & Wine, I was inspired by this recipe to panko-fry some baby asparagus, to go along with the fish. 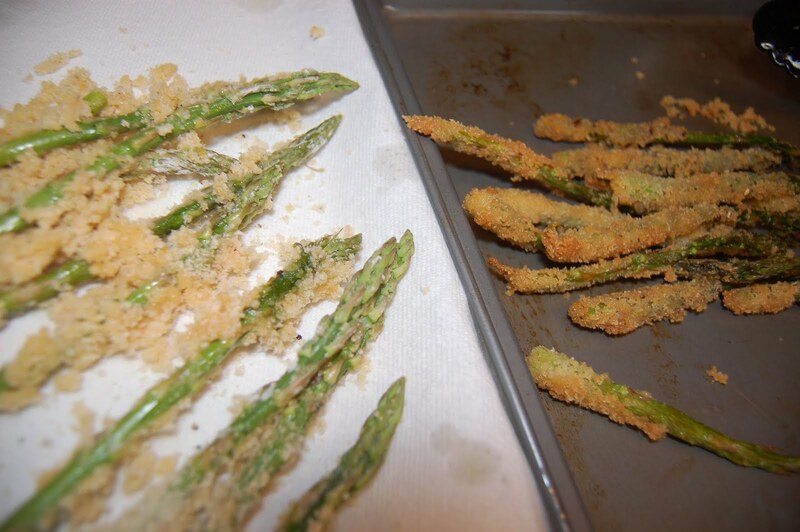 I followed it fairly carefully, though I found that with the baby asparagus, there was less coverage with the flour-egg-panko mixture, especially after a dozen stalks. The first batch turned out beautifully, but the later batches were much clumpier and less like the magazine pictures (as you can probably tell from my photos). I'm interested to try this with larger stalks of asparagus, because of the balance of softer asparagus flesh versus crispier panko crust. I also made some garlic bread -- I need to post about my variants on garlic bread and their relative successes someday soon -- and my husband grilled the tuna on the gas grill, because it is finally (FINALLY!) not snowed-in/too-chilly to grill. I think the temperature of the grill might not have been quite high enough, because the tuna grilled pretty evenly through. I prefer a rather rare tuna in the center, but he likes a more cooked one, so we ended up in the middle, with it still a bit pink and fleshy in the middle but well-done on the edges. I melted a tablespoon or two of butter and added some flour and then the remaining marinade, to make a sauce for the fish. It turned out too thick, so more rose wine went in (to thin it out) and eventually a bit of half-and-half (to mellow out the chipotle). I cigar-cut a few leaves of basil as a garnish, which complemented the fish and sauce quite well, and plated up all four elements. To great acclaim from my husband, who loved the spice and heat as well as the flavor, which makes me eager to try similar mixtures with fish in the future. The first picture above is the pre-fried asparagus on the left, and the fried asparagus on the right; the grilling tuna; the completed plate (I apologize that the yellow tablecloth makes the yellow tones in the food almost disappear, but I adore yellow and orange in my kitchen and dining room, especially during the drab fall/winter/spring months).